Werner Machold was born on 29 July 1913 at Unterneubrunn in the Hildburghausen region of Thüringen. 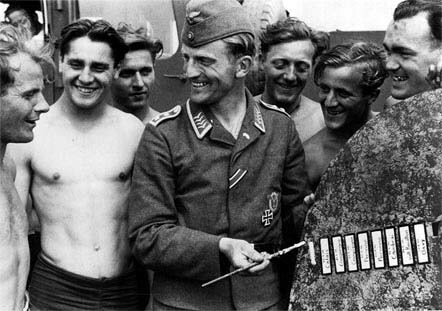 At the beginning of World War 2, Machold was serving with 1./JG 2. He was particularly successful over France in 1940 gaining at least 10 victories, including his first on 14 May. Oberfeldwebel Machold continued to score heavily during the Battle of Britain. He was the eighth German fighter pilot to reach 20 victories. On 5 September 1940, he was awarded the Ritterkreuz for 21 victories.On 7 September, Machold was transferred to 9./JG 2. He recorded his 24th through 26th victories on 30 September, shooting down three RAF fighters. 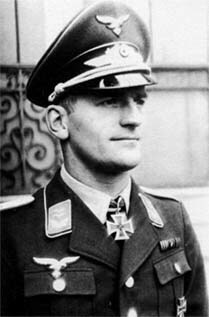 Oberleutnant Machold was appointed Staffelkapitän of 7./JG 2 in spring 1941. Oberfeldwebel Werner Machold painting the ninth bar on the rudder of his aircraft. On 9 June 1941, Oberleutnant Machold, flying his Bf 109 E-7/Z (W.Nr. 5983) “White 15”, force-landed near Swanage, Dorset after receiving damage from anti-aircraft fire from a Royal Navy destroyer during a low-level Jabo attack on a shipping convoy off Portland. He became a prisoner-of-war for the remainder of hostilities. Werner Machold amassed 32 victories in over 250 combat missions.All his victories were recorded over the Western front.